After the model by Jean-Henri Riesener (French, 1734-1806). 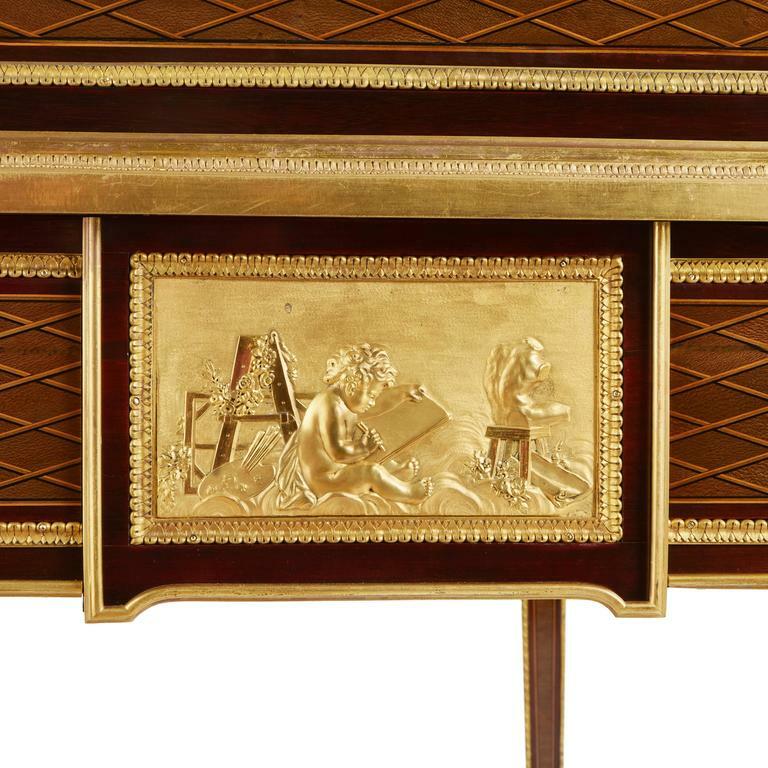 Of the Napoleon III period, in the Louis XVI style, with fruitwood and ebony inlaid in bois de citronnier, mahogany and amaranth, with a three-quarter galleried rectangular top above a roll-top, opening to reveal a leather-lined writing slide with four short drawers and five pigeon holes, the frieze centred by a push button drawer mounted with an ormolu panel with cherubs in the manner of Clodion, the sides similarly mounted with panels representing 'Sculpture', the back veneered to form a centrepiece. 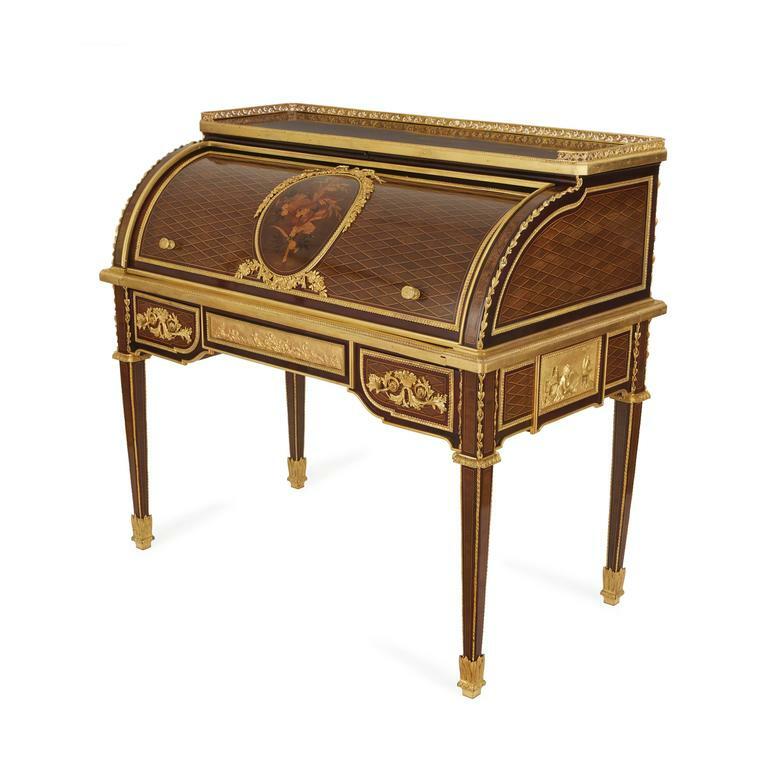 Literature: Christopher Payne, European Furniture of the 19th century, Antique Collectors Club, 2013, p. 111 This roll-top desk is after a famous model by Jean-Henri Riesener which was made for Marie-Antoinette's new apartments at the Chdes Tuileries in 1784 and now forms part of the collection in the Louvre, Paris. P. Bernard is listed at 4 Passage des Postes, Paris from 1856-1876. 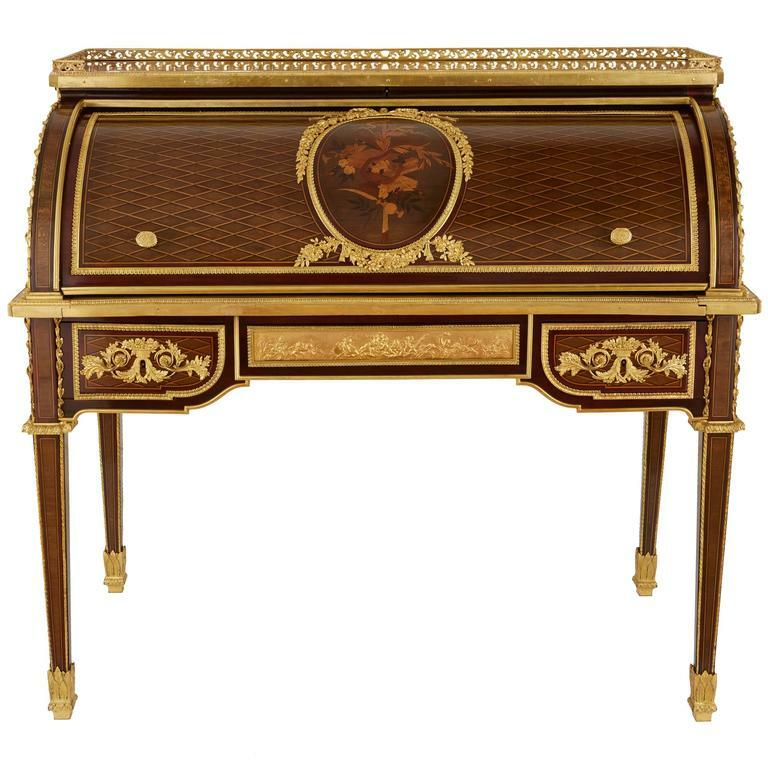 An almost identical roll-top desk stamped by Bernard, sold Christie's New York, 13 December 1983, lot 412. 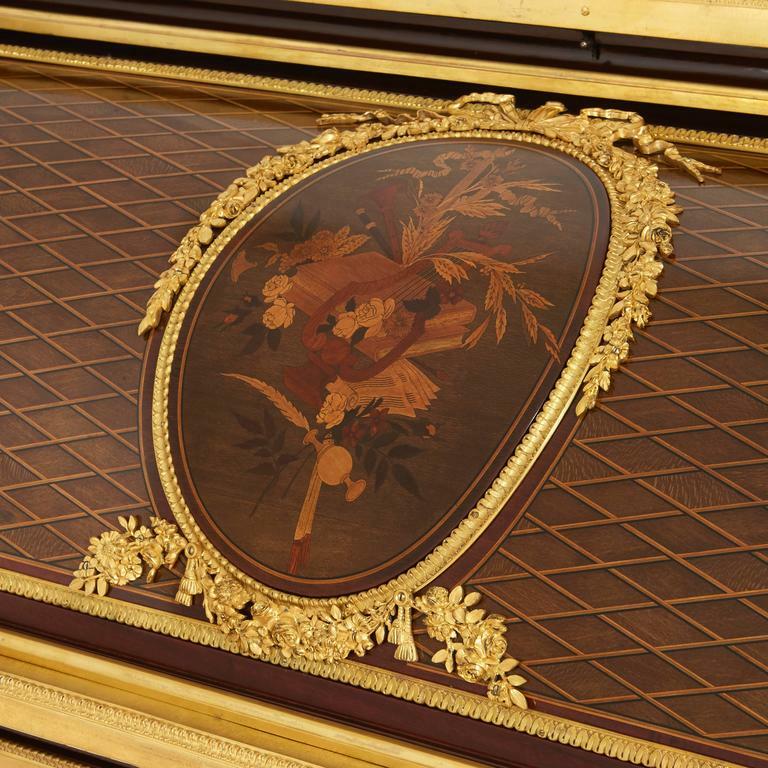 Louis XV style marble-top roll top desk, attributed to Jansen, with a brass gallery, 7 drawers, and 2 leather top extensions. Walnut desk with tambour top that reveals writing top and storage compartments. (Please confirm item location - NY or NJ - with dealer). 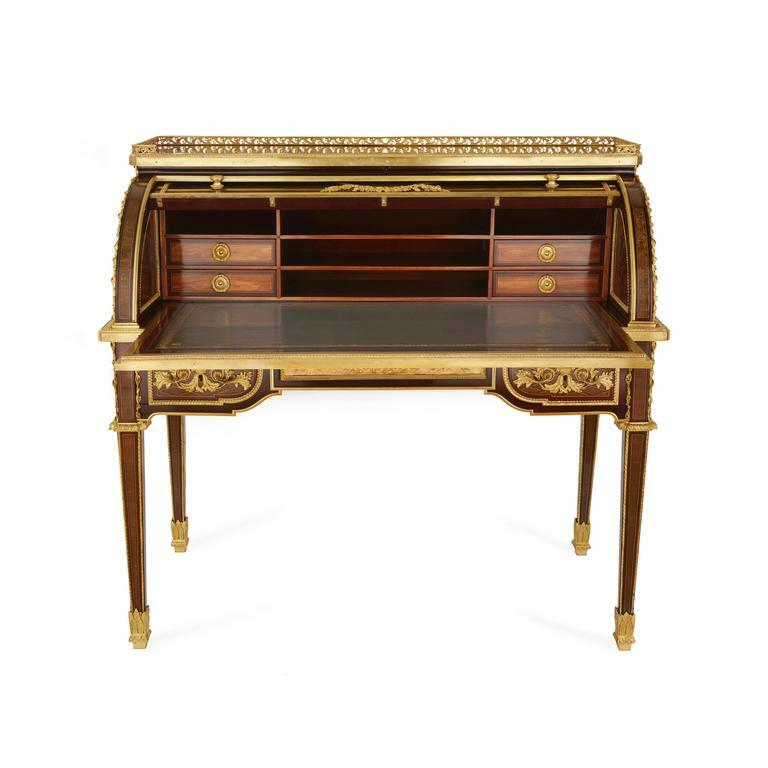 Regency style marble-top desk, attributed to forest, with bronze mounts.